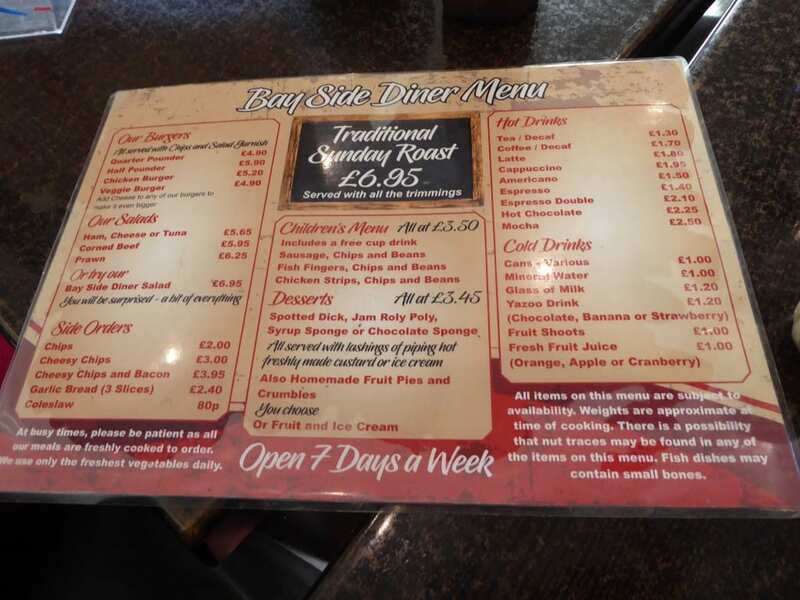 Home » Comments » cookery » Countries » Featured Articles » tours » Travel » UK » Bayside Diner, Pevensey Bay; a Seaside Success! Recommendations are important when you’re looking for somewhere to eat in England. You never know when you’re going to get surly service or inferior food. The best advice I was ever given is, Never go in an empty restaurant. Look for somewhere packed and busy, even if you have to wait. 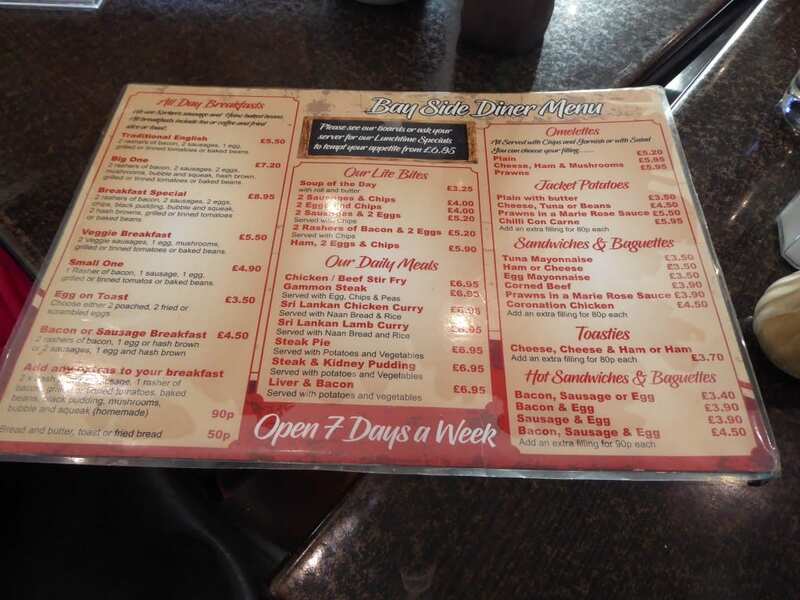 On a recent visit to Pevensey Bay we weren’t looking for anywhere special, just some good food. We hardly glanced at the Bayside Diner as we passed it, but on the way back, we paused and looked at the menu. 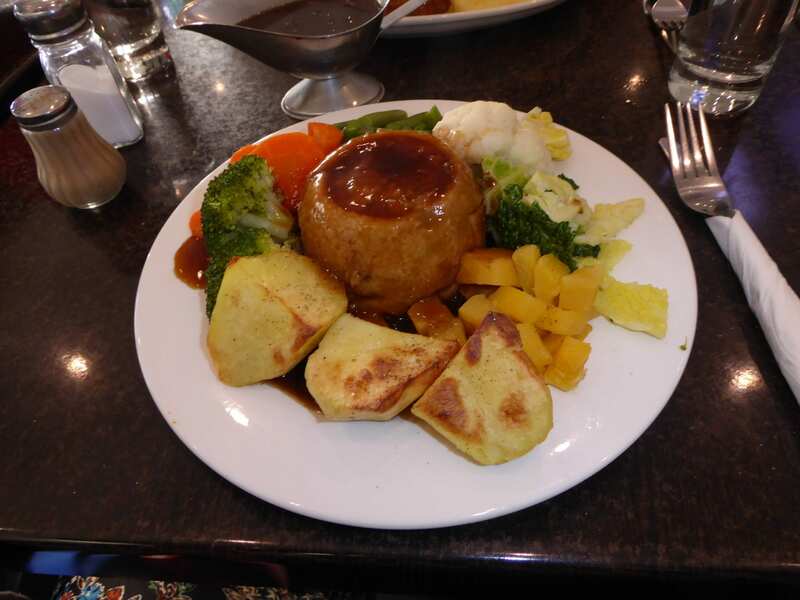 Everything, from roasts to steak and kidney pudding, were around £6.95. Pre-cooked and microwaved, I thought. But most of the tables were occupied, and we were hungry, so we went in and sat down. Suman came over and took our order. I went for the steak and kidney pudding and asked for extra gravy and John ordered sausage, egg and chips. I was asked if I wanted boiled or roast potatoes. We requested tap water, which is refreshing. I don’t want a heavy fizzy drink or coffee with a meal. This can often upset the waiter as they think we should buy drinks. But not Suman. He smiled and brought the glasses along with a jug of extra gravy for me. My meal arrived, and I couldn’t believe it! The pud was in the middle surrounded by seven different types of fresh vegetables! There were roast potatoes, swede, cabbage, cauliflower, French beans, broccoli and carrots. They were all perfect and fresh, and not soggy at all, and not undercooked either! 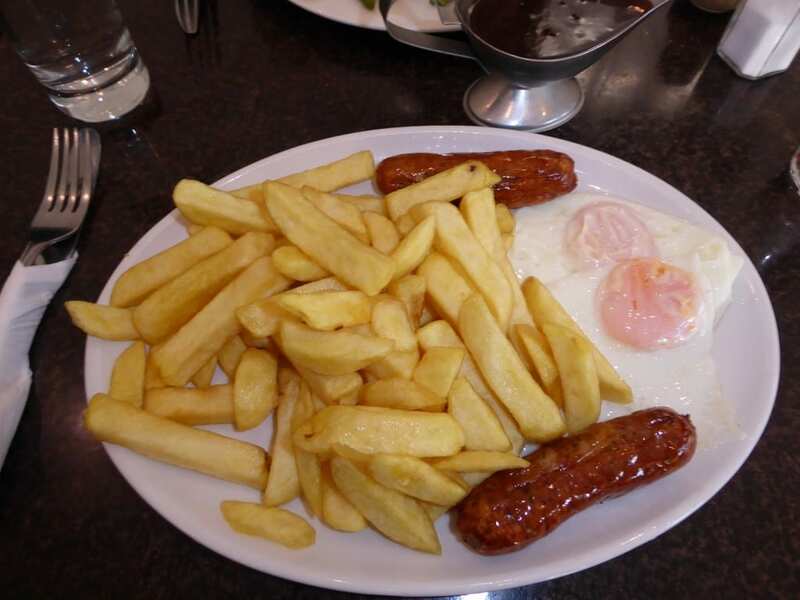 John had two sausages, two eggs, and about a kilo of chips! It cost £5.20. Eavesdropping on other people’s conversations, it was obvious that some of them were regulars, eating there every day. And at those prices, it’s easier than going through all the bother of preparing a meal and eating it alone at home. A Sunday roast is served daily, with a choice of pork, lamb or beef. I saw some and again the plates were full, with a Yorkshire pudding as well. While we ate, Suman never stopped cleaning. 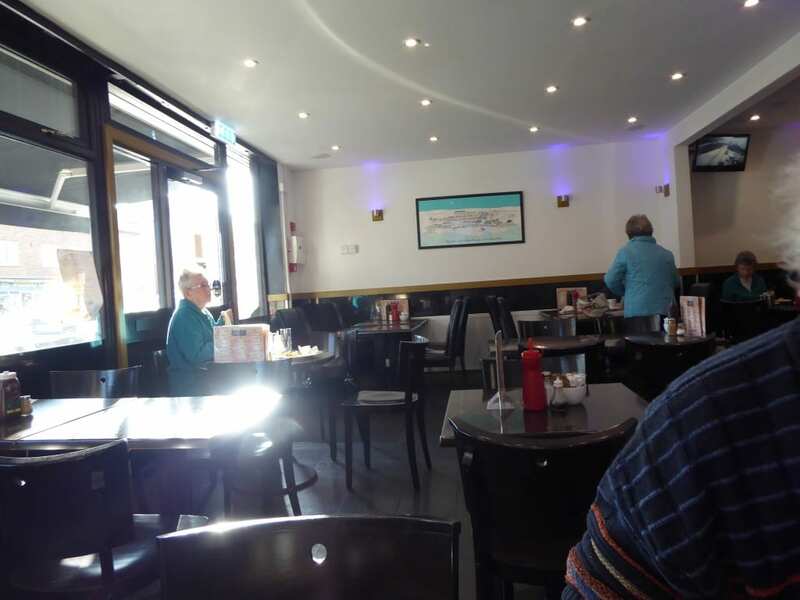 Even though the place was busy, he kept up with keeping the tables cleared and clean. Afterwards I spoke to Suman and his Auntie, Suresh. 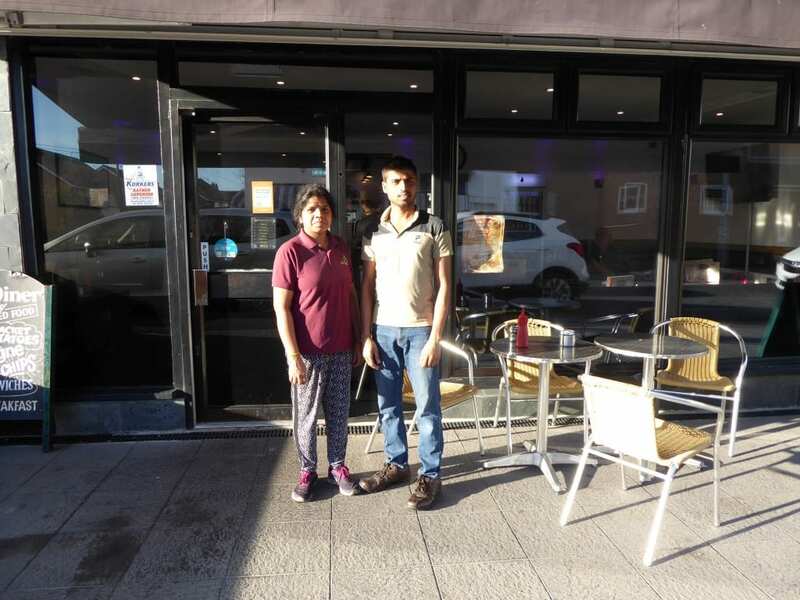 They came to England from Sri Lanka six years ago and Suresh’s family took over the business three years ago and changed it. To my surprise, everything is home-made, including the steak and kidney puddings, which they make and then microwave for just one minute so they don’t dry up at all. I could see the small kitchen behind Suresh. It was spotless and organised. Would we go to the Bayside Diner again? Definitely. It’s worth the journey to visit Pevensey Bay and the castle for a day and have an enormous meal in the Bayside, followed by a stroll along the beach before going home. I want to try their stir-fry, and a curry. It should be delicious, cooked Sri Lankan style! 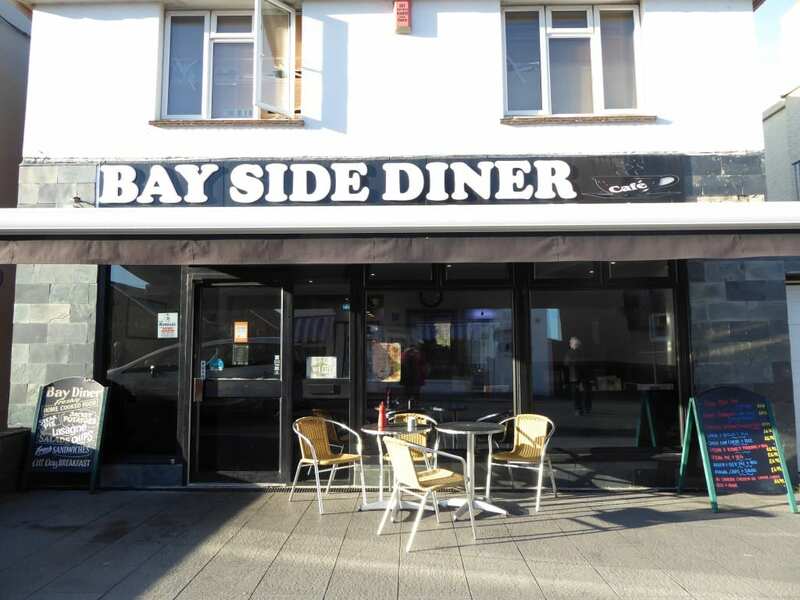 The Bayside Diner is easy to find, one road back from the beach on the one-way system. Parking is opposite, on the beach. There are toilets and a Tourist Office there. Open 7 days a week, 10am-4pm.